How does the poorest school district in Iowa increase its high school graduation rate every year since 2005—from 68 to 78 percent? As Martha Bruckner and Ann Mausbach explained in their example-rich ASCD Annual Conference presentation "Badges, Buttons, and Beliefs: Ten Dynamic Ideas to Increase Graduation Rates," the answer is complex. "Unfortunately, there is no magic answer," Bruckner said. Yet in the hour-and-a-half session, Bruckner and Mausbach presented an impressive compilation of methods that, when used collectively, can result in major graduation rate improvements. At their district—Council Bluffs Community School District—success was the result of several distinct initiatives. One of the most important was their ambitious long-term strategic plan: 100 percent graduation. "We have a strong belief here that 'All Means All'," Bruckner said. She admitted that many in their community might scoff at such a seemingly impossible number, but it was that commitment to thinking of every single student as a "must-graduate" that helped them look at the problem, one student at a time. The second idea, Class of Buttons, is one of the most unique. All students are given "Class of ..." buttons to wear and take home, which ties students mentally to their graduation year. In addition, teachers stop referring to their class as "4th grade," for example, and instead call it the "Class of 2023." The district has witnessed young students arriving at high school graduation ceremonies proudly wearing their own "Class of ..." buttons. Another novel approach, Attendance Checks, creates incentives for the children to come to school. Students are placed into groups, which are given awards if they collectively reach high attendance levels. This creates inner-group peer pressure on the kids to show up so that their friends in the group don’t suffer the consequences of their own absence. The SAM is a new role designed to take administrative stress and daily distractions away from the school principals, freeing them up to better manage the teachers and spend more time in the classroom. The SAM is a middle-management position, so it does not take up a large chunk of the budget, and the net effect on the principal's efficiency is considerable. "It has changed everything," Mausbach said. The current education climate encourages a tremendous amount of time and energy be spent on preparing students to take exams. But does that strategy actually ensure students are prepared for college, career, and citizenship? We've seen the research and heard the debate among teachers, education media, ASCD's own Educational Leadership magazine, and even the White House. Connecting learning today with students’ futures engages and prepares them to take on the challenges and opportunities of tomorrow. In March, we looked what it means for students to be ready and able for their complex and demanding futures. Learn about Quest Early College High School, winner of the 2011 Vision in Action: The ASCD Whole Child Award. Located in Humble, Tex., Quest prepares a very diverse student population for the next phases of their lives by creating a learning environment that allows students to practice taking college courses, work at businesses in their community, and experience the rights and responsibilities of citizenship. Listen to the Whole Child Podcast with Kim Klepcyk, principal at Quest Early College High School; Denise McLean, a teacher and former student at Quest; and Micaela Casales, a current student at Quest, as they discuss strategies for preparing students for college, careers, and citizenship. Hear another viewpoint on what it means to be college- and career-ready and the value of citizenship skills in a conversation between Molly McCloskey, managing director of Whole Child Programs at ASCD and host of the Whole Child Podcast, and Jay Mathews, education columnist for The Washington Post and author. Mathews also answers audience questions on a range of topics including the importance of teacher-student relationships, KIPP charter schools, and the responsibility of education journalists. Consider if U.S. schools are emphasizing the knowledge and skills that students need for a global future with author Yong Zhao. Do you think we need to reform education to maintain leadership in a rapidly changing world? Empower students to understand their rights, responsibilities, capabilities, and opportunities in their educational and civic experiences today as well as in the future. Practice skills such as inquiry, critical thinking, collaboration, public presentation, and reflection that students will use as adults through problem-based learning in the classroom. Take action about the need for college- and career-readiness standards that include proficiency in reading, math, science, social science, the arts, civics, foreign language, health education and physical education, technology, and all other core academic subjects. Use ASCD's legislative agenda and the the Making the Case for Educating the Whole Child tool to guide discussions and decision making in your states and communities. Find resources to help prepare young people for their futures from whole child partners the America's Promise Alliance, Educators for Social Responsibility, the Forum for Education and Democracy, and the National Association of Secondary School Principals. What do you think is critical to preparing young people for the complex futures that lie ahead? The demands of meeting all district, state, and national requirements often seem to leave no time for preparing students for anything else. Yet teaching solely to the test will leave students ill-equipped for college, careers, and citizenship. Recorded live at ASCD's Annual Conference on March 28, this special edition of the Whole Child Podcast features an engaging conversation about powerfully preparing young people for the demands of the future. Have high expectations of every child. Dedicate more time to instruction. Take academic achievement and assessment seriously. What are your reactions to Mathews's viewpoint? What do you think is critical to preparing young people for the complex futures that lie ahead? Download a conversation on this topic with staff and a student from Quest Early College High School, winner of the 2011 Vision in Action: The ASCD Whole Child Award. If you hand a high school transcript to a parent who's never had it explained to them, you're making a big leap that they're going to know why their kid's not on track to graduate, principal Ben Shuldiner said in his Saturday session "How to Get All Students to Graduate." He and guidance counselor Sarah Kornhauser discussed the High School for Public Service's extensive outreach plan to the families of its 400 students. Founded in 2003, the school, where 90 percent of students ar on free and reduced lunch, was recently named the number-one Titl I school in New York State. The school organizes several informative and fun parent outreach sessions throughout the four years of high school—from 8th grade orientation to 12th grade sessions on navigating FAFSA and other financial aid forms. It's important to bring parents in early, give them the tools to navigate and decipher school—speak and processes, and make sure that parents and teachers are on the same page. Show respect for parents by bringing them in to the graduation goal as partners. We can't be successful without spelling out each and every part of the process to parents, Kornhauser said. But what happens when, despite an entrenched college-going culture at the school, parents don't show up to 12th grade college-planning night or 10th and 11th grade on-track-to-graduate night? "We love parents, we want them to be there, but don't wait for them," said Shuldiner. Parents shouldn't be an excuse for giving up on a kid. If parents can't be there, the kids should still be there. 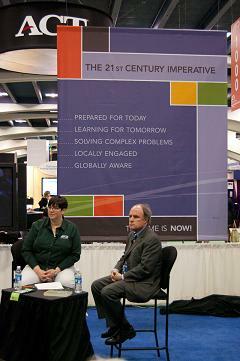 ASCD will live stream select sessions from the 2011 Annual Conference and Exhibit Show in San Francisco. All times indicated are Pacific Time. You can view all livestream sessions on ASCD EDge. To participate in live chat during the sessions, you must log in to EDge or sign up for a free EDge account if you don't have one. You can also view the sessions on Android and Blackberry mobile devices. You will not be able to watch the livestream on the iPad, iPhone, or iPod Touch. Interactive sessions have an online moderator to guide the discussion. Onsite and virtual participants can ask questions, add comments, or reply to comments on the session's chat wall. You can also download presenter resources from the session's livestream page. We do not need reform—we need new forms for teaching and learning. What year is your school preparing your learners for: 1990 or 2025? In this provocative and highly practical session, based on the presenter's ASCD book of the same name, the presenter will lay out steps for transforming your school into a contemporary learning environment. Bringing together 35 years of research on effective instruction and 30 years of experience in helping schools address student diversity, the session will provide educators with the tools needed to help all students meet today's rigorous standards. Successful teaching requires you to create an environment that fosters academic success by engaging and inspiring students rather than trying to control them. In this session, learn how to manage your classroom effectively, and identify five strategies that will inspire academic achievement and unlock your students' natural enthusiasm for learning. In this session, hear from three distinguished principals who are making a difference in the lives of urban high school students: Linda Nathan, founding headmaster, Boston Arts Academy (Mass. ); Baruti Kafele, principal, Newark Tech (N.J.); and Tim King, founder and president, Urban Prep Academies (Ill.). How teachers respond to an incorrect answer significantly influences students' eventual understanding. Resolving errors requires an interaction between students and teachers, with the goal of ensuring that students experience success. Participants will explore questions to check for understanding, prompts for cognitive and metacognitive processes, cues to shift attention, and direct explanations and modeling. A few schools and districts have been able to garner the right mix of hardware, bandwidth, tech support, and professional development to change instruction, truly engage students, and increase student achievement. This session will look what is driving change in the purchase and distribution of content and how this missing link will be a major catalyst to changing our schools. Why do some students get it while some don't? This session will help educators learn how to help students develop cognitive structures needed to process information for meaning, such as finding patterns, formulating predictable rules, and abstracting generalizable principles that transfer and apply learning. What sessions will you be watching? At a time when globalization and technology are dramatically altering the world we live in, is education reform in the United States headed down the right path? Are schools emphasizing the knowledge and skills that students need in a global society—or are schools actually undermining students' strengths by overemphasizing high-stakes testing and standardization? Are education systems in China and other countries really as superior as some people claim? Explore these questions in this talk with Yong Zhao, author of Catching Up or Leading the Way: American Education in the Age of Globalization. Born and raised in China and now a distinguished professor at Michigan State University, Zhao bases many of his observations on firsthand experience as a student in China and as a parent of children attending school in the United States. His unique perspective leads him to conclude that "American education is at a crossroads" and "we need to change course" to maintain leadership in a rapidly changing world. As you listen and browse the book, consider the following questions alone or with colleagues at your school. What are the traditional strengths in terms of education, culture, and economy in your community? What is unique about your community, or what do you have that others do not have in your community? What can you do better than others? How do you preserve creativity and protect individual passions in students? Can we have both standards and individual creativity? Find more from Zhao and others in this issue of ASCD Express on approaches to education that will help students lead and succeed in the global age. Bronx Preparatory Charter School in New York prepares underserved middle and high school students for higher education, civic involvement, and lifelong success by holding high expectations and providing a caring, structured environment. The school's 700 students in grades 5–12 spend 50 percent more time in school than their peers in traditional public schools. Heavy emphasis is placed on math and literacy. Middle school students attend up to two hours each in math and English daily and are introduced to high school-level content in 8th grade. During the 11th and 12th grades, students can take college-level courses. College is integrated into every aspect at Bronx Prep, with rooms named after colleges and universities and teachers constantly referring to students' future higher education. Consistent science, social studies, physical education, and artistic block scheduling provide a well-rounded education. Middle and high school students spend one hour a day, four days a week participating in classes such as piano, violin, dance, and drama. One hundred percent of the school's first three high school graduating classes were admitted to four-year colleges.